Matt had retired from the Baltimore Police to move to Rehoboth, a small vacation town, with his son, Henry, where he was serving on the local Rehoboth Police Force. When the Director of the Rehoboth SPCA is murdered, it is clear there are a lot of animal lovers in Delaware who are not happy with the SPCA's performance in getting stray cats and dogs adopted. It appears Rehoboth's SPCA is more concerned with killing as many animals as possible. The "No Kill" people are the obvious suspects in the murder of the director, Gary. In No Kill Station, by Diane Meier, there is much more to this tale than meets the eye and Matt finds himself thrown into a maelstrom of conflict that includes dog-fighting, mobsters, bribery, corruption and a romance with the woman who will become the prime suspect in the murder of the SPCA director. Throw in some supernatural happenings and you have all the makings of a cozy mystery/romance. 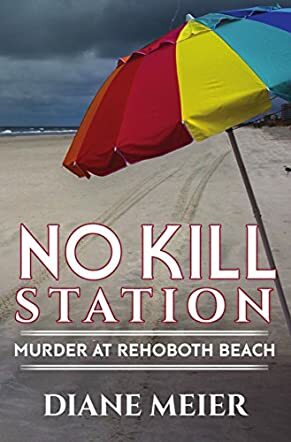 No Kill Station: Murder at Rehoboth Beach is a mystery that grows on you. I particularly liked author Diane Meier's drawing of the principal characters of Matt, Clara and Sharon. Matt was an upstanding citizen trying to rebuild his life after a messy divorce and was always willing to put his principles first, especially when it came to protecting animals. His relationship with Clara and the unusual supernatural themes just added to the excitement of the murder mystery. This is an incredibly relaxed and easy book to read and for lovers of clean, cozy mystery/romances, it would be perfect. The author uses the novel to impart important information about the way in which we, as a society, deal with stray animals. She uses the tale to convey her own beliefs on the importance of the humane treatment of animals, as a reflection of a society's health. I particularly liked that aspect of the story. A very good first-up effort from Meier. I enjoyed this book; a good story, well told.